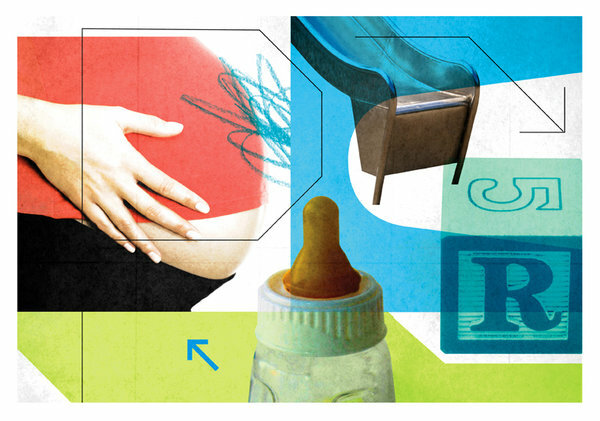 For generations, obstetricians have been quick to cut the umbilical cord of newborns. That’s changing, and most expectant parents should anticipate at least a short delay before the cord is cut. In January, the American College of Obstetricians and Gynecologists became the latest major medical organization to formally recommend that doctors routinely wait before clamping and cutting the cord. Waiting at least 30 to 60 seconds allows more blood to return to the newborn during the birth process, when blood vessels leading away from the baby start to constrict, and delivers extra iron, which is critical for a baby’s brain development. During this time, the baby can be dried and covered with a towel for warmth and rest skin-to-skin on the mother’s abdomen or chest, the A.C.O.G. statement says. In a cesarean birth, the surgeon or an assistant may hold the baby during this time. The group’s previous recommendation, issued in 2012, advised a delay for premature infants but said there wasn’t enough evidence to recommend it for those born full-term. “As more and more evidence accumulated, I think our comfort level with saying this looks like the right thing for all babies, term and preterm, seemed the right thing to do,” said Dr. Maria Mascola, a maternal and fetal medicine specialist in Marshfield, Wis., and the lead author of the group’s new recommendation. Other medical groups already endorse delayed clamping. The American Academy of Pediatrics, like A.C.O.G., recommends waiting at least 30 to 60 seconds before cutting the cord, while the World Health Organization advises waiting at least 60 seconds and the American College of Nurse-Midwives says to wait two to five minutes. Before the mid-1900s, it was common practice to wait a few minutes before severing the cord. Obstetricians started cutting it immediately in part because of a misguided belief that it would reduce the risk of hemorrhage in the mother (subsequent research found that it doesn’t), a trend that accelerated with the increasing specialization of medicine, with eager pediatricians ready to care for the newborn while the obstetrician attended to the mother. “We didn’t even think about it. We wanted to get that baby quickly, so clamp the cord and give him to us, and they were delighted to do it,” said Dr. John Kattwinkel, a professor of neonatology at the University of Virginia and among the nation’s first class of board-certified neonatologists in 1975. But more recent research challenged the common practice of immediate cutting. A 2011 Swedish trial found that only 0.6 percent of full-term babies with a three-minute delay in cord clamping were iron deficient at 4 months of age, compared to 5.7 percent with immediate cord clamping. By 4 years of age, children with delayed cord clamping had modestly higher scores in fine motor and social skills, a difference particularly evident among boys, who may be more susceptible to iron deficiency. Other research, summarized in a 2013 systematic review of studies, has consistently found that waiting to cut the cord gives babies a boost in iron. Iron deficiency is thought to affect about 8 to 14 percent of infants and toddlers in the United States; the prevalence is much greater in developing countries. A 2015 Preventive Services Task Force report noted that preventing iron deficiency is most likely preferable to treating it. “Even babies who are well cared for and have access to good medical care, and whose family has access to enough food, can still become iron deficient,” Dr. Mascola said. Delayed cutting may offer additional benefits beyond reducing the likelihood that a child will develop iron deficiency. In addition to iron, umbilical cord blood also contains immunoglobulins and stem cells, and researchers speculate that delayed cord clamping might aid immune function and tissue healing, though this has not been well studied. “It’s hard to measure those things, but there’s every reason to believe that there are benefits there as well,” Dr. Mascola said. In preterm babies, delayed cord clamping has additional benefits, including a lower incidence of intraventricular hemorrhage, or bleeding in the brain, and a serious bowel infection called necrotizing enterocolitis. Both are common complications of premature birth. While many hospitals have adopted delayed cord clamping for preterm infants, it isn’t known how many are doing it routinely for full-term babies. “Many, many places are beginning to adopt this into their setting, so it may take some time, but I think the practice is probably changing,” said Dr. Tonse Raju, chief of the pregnancy and perinatology branch of the National Institutes of Health. The A.C.O.G. statement cautions that babies with delayed cord clamping may be more likely to require treatment for newborn jaundice, a buildup of blood components that causes yellowing of the eyes and skin, though Dr. Raju said this concern is based on older studies that may have been flawed. If the mother or baby needs urgent medical attention, clamping the cord immediately may also be necessary, the group says. One such scenario is when a baby doesn’t start breathing right away and might need to be moved immediately to a warming table with the necessary medical equipment. Once babies start to breathe, they shift from receiving oxygen from the placenta to getting it through the lungs. “You hear that loud, beautiful cry, and what they’re doing is opening up the vasculature as well as the airways of their lungs and making room for that extra blood,” Dr. Kattwinkel said. He and other researchers believe that it may be beneficial to leave the cord intact — with oxygenated blood still flowing from the placenta — at least until a baby takes a few breaths. Building on earlier research, Dr. Kattwinkel and colleagues at the University of Virginia are leading a randomized clinical trial at eight medical centers around the country to test whether it is safe and beneficial to resuscitate very preterm babies with the cord still intact. There are at least 16 ongoing studies of cord clamping protocols around the globe. Some are investigating whether “milking” the umbilical cord (grasping it close to the mother and then pushing the blood toward the baby) to speed up transfusion from the placenta provides benefits while still allowing the cord to be cut quickly, which could be useful in cesarean births or emergency situations. “It’s such a critical period for babies, right in the first few minutes of life, and you want them to be off to a good start,” Dr. Kattwinkel said. Are Good Doctors Bad for Your Health? Are Midwives Safer Than Doctors?